Berlin is a big city known more for its sausages than Vegan-friendly sweets, but after a bit of sleuthing I'm happy to report there's many places to get your dessert on with no animal products involved! From Prenzlauer Berg to Friedrichshain, then down in to Kreuzberg, take a walk down vegan lane in vibrant Berlin, Germany! Maja's Deli: Adorable cow banners declaring, "Holy Cow, it's Vegan!" 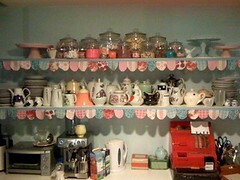 hang from sunny yellow walls, while tulips in bottles adorn every table. This tiny all vegan cafe serves delicious food, but also has a large rotating selection for baked goods coming fresh from the kitchen all day. 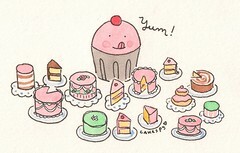 Cakes, cupcakes, cookies, muffins, brownies, & tarts: they're all there! While I can't recommend the cheesecake, the Apple Raspberry cake I had was lovely & many of the other baked goods looked to die for! Maja's Deli, Pappelallee 11, 10437, Berlin; online at majas-deli.de. Hans Wurst Vegancafe: Just a few blocks from Maja's, Hans Wurst scraps the sunny vibe in favor of a sleek one with hardwood floors, large windows, & modern seating. While the main focus is on 100% organic, 100% vegan food, Chocolate Mousse & other desserts are available daily. Hans Wurst Vegancafe, Dunckerstrasse 2a, 10437, Berlin; online at hanswurstvegancafe.blogspot.com. Cupcake: A dreamy retro styled bakery in Friedrichshain, Cupcake is one of the most gorgeous cupcake shops you'll find anywhere! The owner Dawn is an American gal who moved overseas & opened her shop, the first of its kind in Berlin! 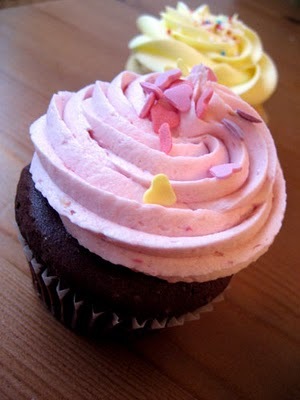 A daily rotating Vegan cupcake or two is available alongside the non-veg versions. Additionally, they've been known to have vegan pie! To wash everything down, grab yourself some soy milk or coffee with soy. 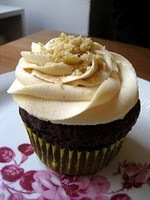 We still think about the awesome Chocolate cupcake with fluffy Peanut Butter buttercream; so dreamy! 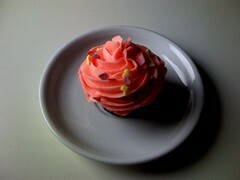 Cupcake, Krossener Strasse 12, 10245, Berlin; online at cupcakeberlin.de. Caramello Eis: Not feeling like baked goods? How about some vegan ice cream? Caramello Eis will cure your craving with a large selection of fruit flavors or options made with soy milk such as Latte Macchiato, Hazelnut, or Walnut! Just be sure to ask which options are vegan, so you get what you came for! Caramello Eis, Wühlischstraße 32, 10245, Berlin; online at caramello-eis.de. 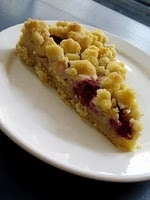 Cakespy Note: We know that sometimes you need something savory to work up an appetite for cake--if that's the case, Melisser says run, don't walk, to Vöner, located at Boxhagenerstr. 56 for some Seitan Döner fresh from a rotating grill placed in freshly baked bread filled with veggies & spicy sauce! Veni Vidi Vegi: An absolutely animal-product-free haven for vegans! Veni Vidi Vegi is a small, all vegan grocery store with tons of sweets & other goods for sale! Here you'll find the Nutella-like spread Chocoreale, White Chocolate bars, Rice Milk Chocolate bars, Gummies, cookies, brownies, & other prepackaged delights. They also have a freezer with lots of vegan ice cream bars & pints. Be prepared, they only accept cash. Veni Vidi Vegi, Pücklerstr. 32, 10997, Berlin; online at veganladen.de. Yellow Sunshine: Known as a vegetarian & vegan fast food spot, amongst the veg*n burgers & seitan currywurst you'll find options for your sweet tooth as well! Tiramisu is made in house daily, although it's not always ready when you are, so call ahead if you're insistent on consuming it. They also have chocolate & caramel soy puddings, plus other grab & go sweets. It's a great place for a quick bite before heading next door to Wild At Heart to catch a band or a beer (or both)! Yellow Sunshine, Wiener Straße 19, 10999, Berlin; online at yellow-sunshine.com. What do you think of when you hear Germany? Schnitzel? Steins of Bier? Well, that's what I thought too until I arrived in Berlin where the air is filled sweetness and the streets are paved in chocolate. 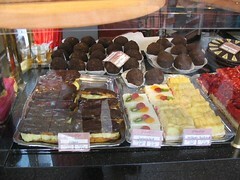 Okay, so I may be exaggerating a tad, but Berlin is Germany's hidden treasure trove of pastries and sweets. Bakeries line cobble stone streets offering every sweet you can imagine. From the Berliner Doughnut (a chocolate creme and black cherry jam filled pastry) to the Apfelstrudel, an almost sickly-sweet flaky pastry with caramel apple filling. But heed my advice and bring a friend along to share because all of the sweets that I came across were of unearthly proportions. On my second day in Berlin feeling fatigued from the Fredrichstrasse boutique-y shopping district and in need of a afternoon pick me up I stumbled across a baby blue building with a sign reading Cupcake Bakery (not to be confused with Cupcake from above). 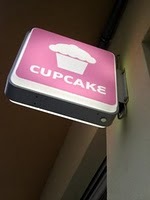 To my surprise the cupcake trend has gone transatlantic. Inside the bakery looked like a scene from a fairytale, pastel colored plates and bowls and baking ingredients filled the shelves and a pleasantly plump woman behind the counter with a toothy smile. After a few minutes of awkward translations I walked out with a chocolate cupcake with pink frosting and a Tobias, a chocolate German ale, which the woman insisted I have. Beer and chocolate? I was a bit skeptical but after my first bite along with a sip of Tobias I couldn't remember a time when I thought beer and chocolate didn't go together. Moral of the story? Next time you take a trip to Germany skip the Oktoberfest and go straight for the pastries.